Moving or coming to visit Valley Springs? I just moved here and I wish I would have researched the cell phone coverage maps for Valley Springs before I bought this house in Burson, CA. 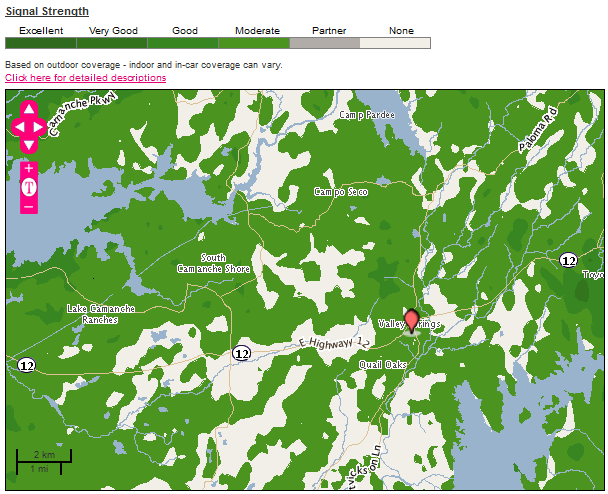 Appears almost all cell phone carriers in the area skip over my house. Yeehaw! So at some point it looks as though I will be investing in a small cell tower with a repeater and amplifier to get a stronger signal. I’ll write a post about the process when I get thru doing the research and buy something. We are off Burson Road in Burson, CA; pretty close to Lake Camanche. Let me tell you our service is not that great on both phones. In the house we don’t get any service. Outside she is on the Edge network with one bar, I get one bar that rotates between Edge and 3G service. 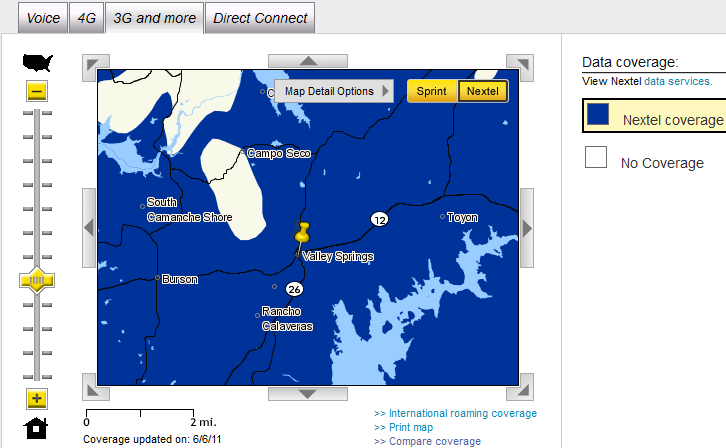 AT&T Cell Phone Coverage Maps In Valley Springs California – Check coverage on AT&T site here. 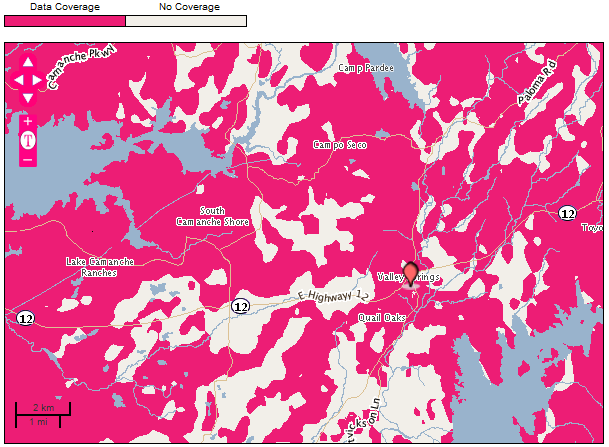 T-Mobile Cell Phone Coverage Maps In Valley Springs California – Check coverage on T-Mobile site here. 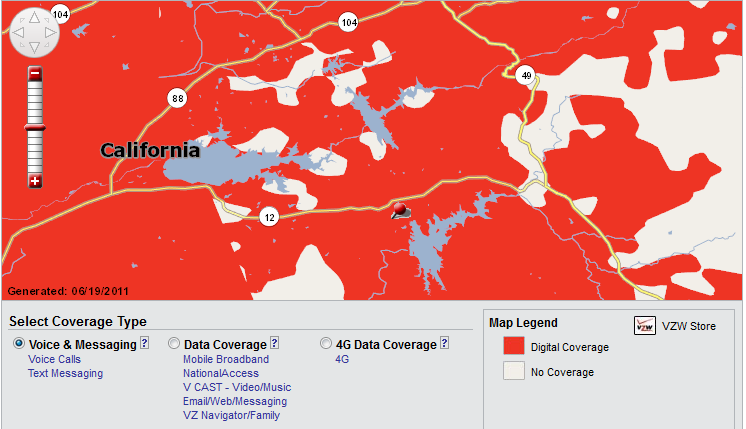 Verizon Wireless Cell Phone Coverage Maps In Valley Springs California – Check coverage on Verizon Wireless site here. 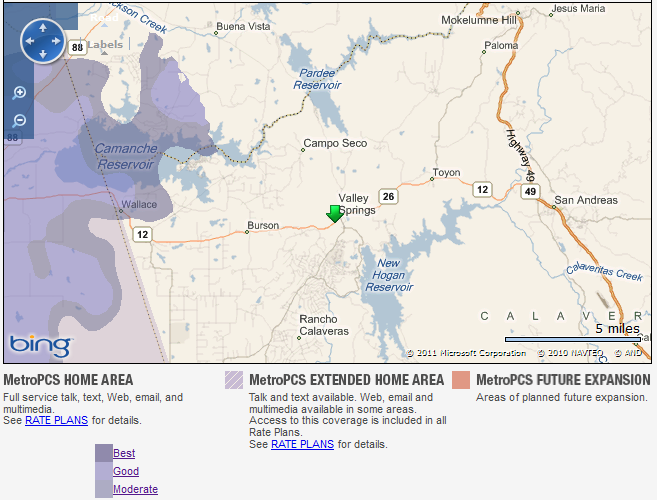 Metro PCS Cell Phone Coverage Maps In Valley Springs California – Check coverage on Metro PCS site here. 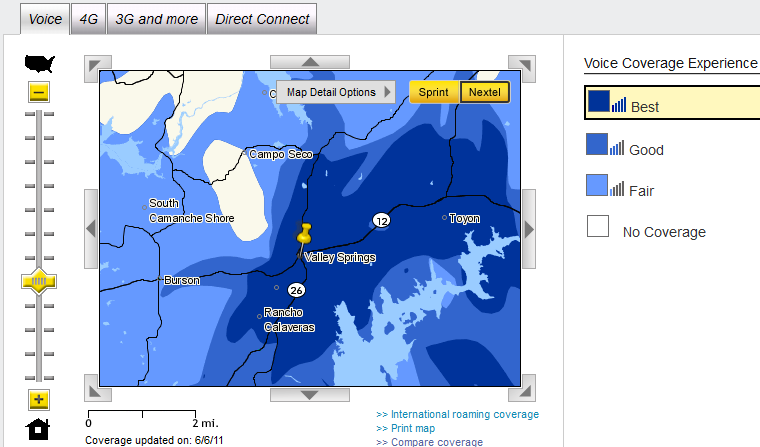 Sprint Cell Phone Coverage Maps In Valley Springs California – Check coverage on Sprint site here. 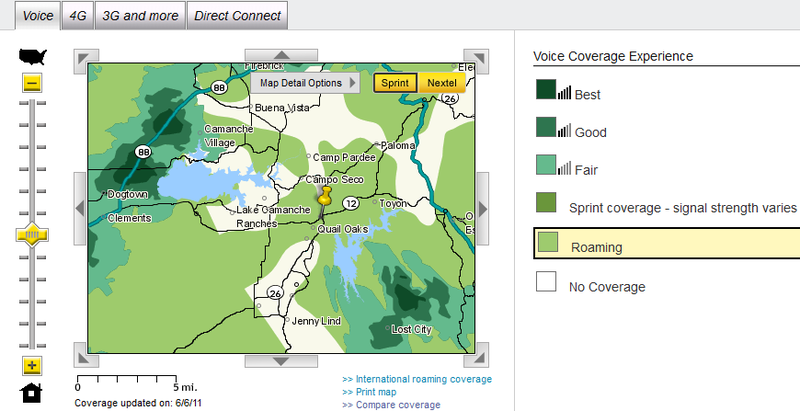 Nextel Cell Phone Coverage Maps In Valley Springs California – Check coverage on Nextel site here. 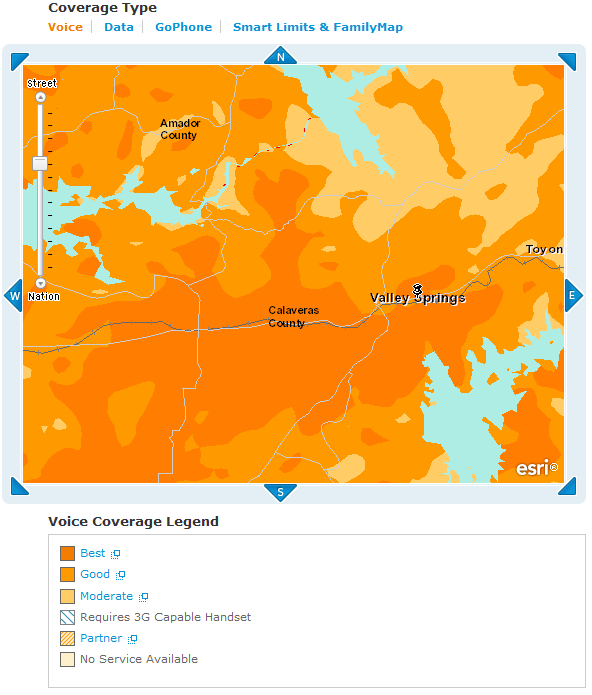 Golden State Cellular Cell Phone Coverage Maps In Valley Springs California – Check coverage on Gold State Cellular site here. Unfortunately they have not provided us with coverage maps. 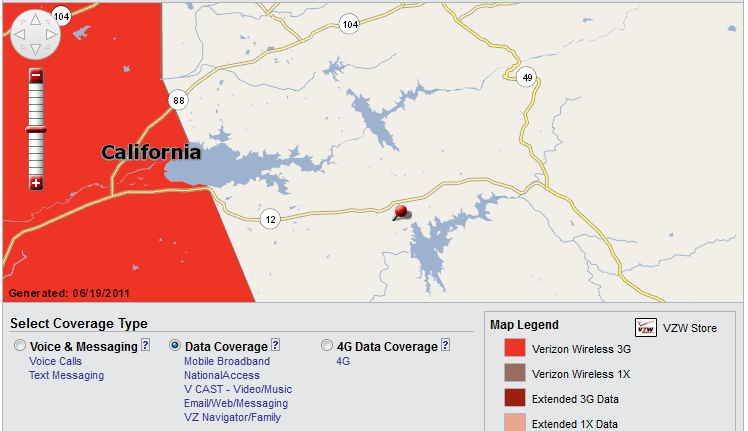 As of now we are waiting on Golden State Cellular corporate to provide us with a coverage map. These maps are constantly being updated and signals can change due to many variables. Check on the carriers web site for the most up to date maps. Clearly I’m new to the area… Do any of you know if I missed any cell phone companies? 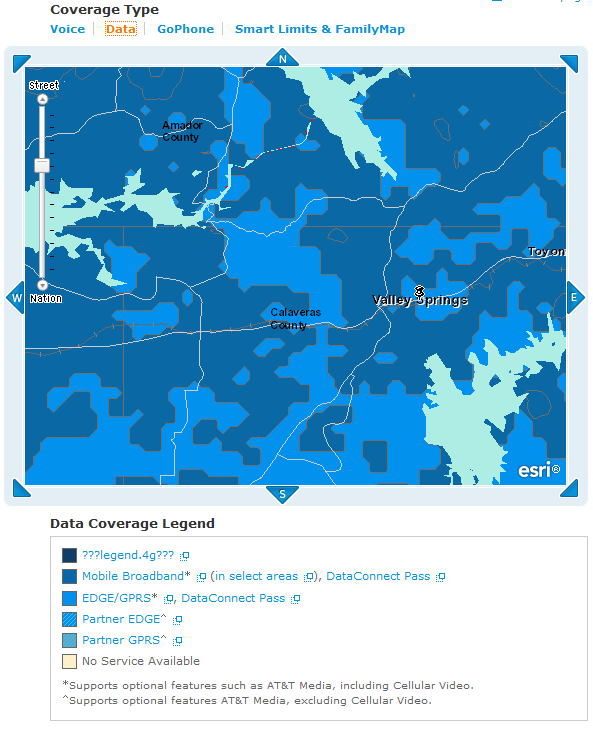 What service is best in this area? I’d love it if you would post a comment about what service you like best and a cross street of where you are located to help people choose the best cell phone provider. This entry was posted on Sunday, June 19th, 2011 at 12:25 AM	and is filed under Misc.. Both comments and pings are currently closed. Frustrating! Thanks for any information you can provide. I wish I had some better advice for you. Most of the cell companies give you 3 days to try out the phone and you will have the ability to bring it back and cancel your contract if you don’t get service. That may be your best bet.. Be sure to ask them about any restocking fees. May be best to just get a cheapie phone to try first. They usually don’t have restocking fees on those models. I don’t know anyone with Nextel, but it looks like they are king in our area. I travel a lot so AT&T seems to be my best bet right now overall. Whatever you decide PLEASE report back to us what area of Burson you are at and what phone and cell service you decide to use. I can’t remember at the moment, but if he pays for the IPhone tethering option you may be able to use his phone to get data and make calls If Verizon allows calls over a WIFI connection. Just watch how much data you use so you don’t have any overages, they add up fast! Do you all have internet service? Who are you using if so?